Nancy Ambrose King, oboe, is the first-prize winner of the Third New York International Competition for Solo Oboists, held in 1995. She has appeared as soloist throughout the United States and abroad, including performances with the St. Petersburg, Russia, Philharmonic conducted by Fabio Mastrangelo, the Janacek Philharmonic in the Czech Republic conducted by Kimbo ISHII-ETO and Petr Vronsky, the Festival Internacionale de Musica Orchestra in Buenos Aires, Argentina conducted by Dominique Fanal, the New York String Orchestra conducted by Alexander Schneider, and the Sinfonia da Camera conducted by Ian Hobson. She has performed as recitalist in Weill Recital Hall and as soloist at Lincoln Center and Carnegie Hall. She has recorded three CDs for Boston Records, the solo recordings “Nancy Ambrose King: The Winning Program” and “Évocations”; and a recording of flute and oboe music with flutist Amy Porter entitled "Porter-Ambrose King". She has also recorded two CDs for the British label Cala Records, featuring oboe concertos of Mozart, Goossens, Lebrun, Martinu, and Vaughan-Williams, recorded in the Czech Republic with the Janacek Philharmonic Orchestra with whom she has toured as soloist in Austria and the Czech Republic. Her most recent recording, for Naxos Records, is of newly rediscovered Quintets for oboe and strings by Franz Krommer. She can also be heard in performances on the Athena, Arabesque, and CBS Masterworks labels. She was a finalist in the Fernand Gillet Oboe Competition held in Graz, Austria, and has been heard as soloist on WQXR radio in New York City and NPR’s “Performance Today”. She has taught and performed in the Sarasota Music Festival, Idyllwild Music Festival, Bowdoin Music Festival, Marrowstone Music Festival, Strings in the Mountains of Steamboat Springs, and the Hot Springs Music Festival, and has appeared as a recitalist throughout the world, including the American Academy of Music in Rome and the Royal Conservatory of Music in Stockholm. Her playing has earned high praise from a variety of critics, including the American Record Guide: “Marvelously evocative, full of character, sultry and seductive, with a soft-spoken, utterly supple tone, and as musically descriptive as any I have heard…a fine exhibition of thoroughly musical oboe playing”; "She plays not only with delicacy, but also with an intense, almost rapturous sound that is second to none in expressivity and gradation. Delightful!". "...a lovely player with a tone that surpasses that of most other American oboe soloists. It defines delicacy, yet is strangely assertive, like a soft-spoken woman who nonetheless speaks up strongly when her mind is made up. ", Fanfare: “Nancy Ambrose King is clearly a skilled musician of great promise, with a sterling technique”, and The Double Reed: “…thoughtful, expressive, and perfectly controlled performance of consummate accuracy. It’s not that she makes it sound easy-she makes it sound perfect”, "Ms. King's fluid technique, combined with clean and accurate articulations, makes the most complex passages flow and sounds effortless. Combine these aspects with a beautiful tone and a sensitive touch in the lyrical passages, all oboists have a new level to which to strive. " Currently Associate Professor of Oboe at the University of Michigan and President of the International Double Reed Society, she was previously Associate Professor and University Scholar at the University of Illinois, Urbana-Champaign. She has also served on the music faculties of Indiana University, Ithaca College, University of Northern Colorado, and Duquesne University Schools of Music. 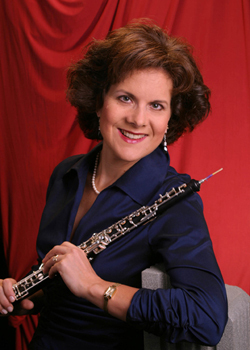 She has performed as principal oboist in Sinfonia da Camera, Michigan Opera Theater Orchestra, Flint Symphony Orchestra, Heidelberg Opera Orchestra, Colorado Symphony, Greeley Philharmonic, Indiana University Festival Orchestra, and the Tanglewood Music Center Orchestra, as well as performing in the Los Angeles, Boston, Detroit, and Rochester Philharmonic Symphony Orchestras. A graduate of the University of Michigan with a Bachelor of Music degree, Ms. King was the recipient of the school’s prestigious Stanley Medal. She received her Doctor of Musical Arts, Master of Music, and Performer’s Certificate from the Eastman School of Music. She lives in Ann Arbor with her husband Bill, a clarinetist, and their two sons, Ryan and Trevor. Nancy Ambrose King's music is available for purchase from the iTunes Music Store. Previews of all selections are also available in the BlockM Records catalog.